Son of former Cleveland HB Dub Jones, Bert Jones received his first exposure to pro football as a ball boy for the Browns. Achieving All-American status as a senior at LSU, he was taken by the Colts in the first round of the 1973 NFL draft (second overall). 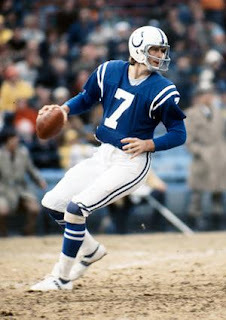 Jones had a rough rookie season with a team in disarray and was involved in a quarterback controversy as he split time with Marty Domres in ’74. Under new, offensive-minded Head Coach Ted Marchibroda in 1975, Jones gained the starting job and broke out with 2483 yards, a 59.0 completion percentage, and 18 TD passes to just 8 interceptions (for a league-low 2.3 percentage). The team started slowly but gained momentum in the second half of the season and won the AFC East with a 10-4 record. An outstanding passer with mobility and strong leadership skills, Jones appeared to be developing into an elite quarterback. Colts went 11-3 to finish first in the AFC East while leading the NFL in total yards (5236), passing yards (2933), scoring (417 points), and TDs (51). Lost AFC Divisional playoff to Pittsburgh Steelers (40-14). Jones had another strong year in 1977, leading the NFL with 224 completions while passing for 2686 yards and 17 TDs. The Colts won a third straight division title but suffered a tough overtime loss to the Raiders in the Divisional round of the playoffs. However, shoulder injuries caused Jones to miss most of the 1978 and ’79 seasons – he saw action in just seven games and the team collapsed. While he returned in 1980 and passed for a career-high 3134 yards, the Colts were no longer a strong team and went 7-9. After passing for 3094 yards and 21 touchdowns with a 2-14 club in ’81, Jones, actively battling the front office, was traded to the Rams but appeared in just four games due to a major neck injury and retired. For his injury-shortened career, he passed for 18,190 yards with a healthy 56.1 completion percentage and 124 TDs to 101 interceptions. He also rushed for 1429 yards on 247 carries (5.8 avg.) with a high of 321 in 1975.